The black RCF TTS 15-A is a 15" 2200W active subwoofer designed to provide low-frequency reinforcement for A/V system installers, audio engineers, and DJs in outdoor environments or houses of worship, concert venues, and live stage applications. Its Class-D amplifier delivers 2200W of power to the 15" woofer, which produces a frequency response of 40 to 400 Hz and is hyper-vented for heat dissipation. 32-bit DSP processing yields simple adjustment of input gain, delay, and crossover presets. RDNet control via EtherCon I/O allows comprehensive remote parameter control and system monitoring. XLR and powerCON inputs and outputs are employed for straightforward integration with standard PA components. 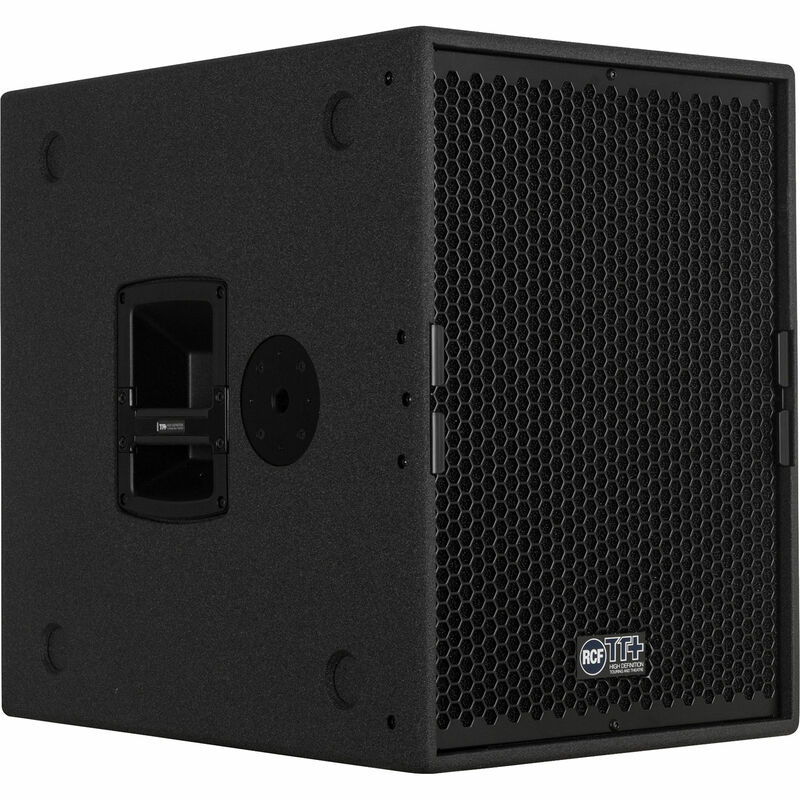 The TTS 15-A boasts a sturdy wood cabinet, built-in carry handles, and M20 pole sockets for tour readiness. The switch-mode power supply Class-D amplifier integrates a low-noise, 32-bit DSP circuit, controlled through the RCF RDNet network to handle the clipping limiters, RMS limits, polarity, amplitude, timing, and equalization. All settings, monitoring, and advanced features are available inside the integrated RDNet Networked Management software. The rear-panel encoder adjusts volume, delay, and presets. The cabinet is made of high-quality birch plywood with weatherproof treatments. The sub is stackable and lightweight for easy setup and tear down. The polyurea coating and rugged structure of the cabinet survive long-term use and transportation while the separate housing for the amplifier guarantees component efficiency and reliability. A pole receptacle on top and side allows the woofer to be deployed in various situations. In order to dissipate the heat generated by the powerful voice coil, RCF engineers have developed an internal ventilation system with low power compression. The Hyper Ventilation System is the result of a complex combination of ventilation ducts in the voice coil former, in the magnetic structure, and in the woofer's basket. Demodulation rings reduce the harmonic and intermodulation distortion due to voice coil displacement and, as input current varies, the system inductances are more linear. The cone is water-resistant. The airflow in the vented ports suffers the turbulence of the air due to the speed of air. The improved vented port is a proprietary solution that enhances aerodynamic behavior of the air, thereby gaining efficiency and reducing distortion. RDNet is a proprietary protocol that provides straightforward monitoring and intuitive control of the audio system down to every device and object. Each device has its own DSP, giving the possibility to address presets or parameters specific to single or groups of objects. A network user can change level, delay, EQ, and advanced subwoofer configurations.